The poetry embedded in every frame and every feeling of “The Rider” is something that mainstream Hollywood pictures can only dream of. It offers a different type of entertainment—one that is quiet, yearning, inspiring the viewer look within, to ponder about one’s place in life and where it is possibly heading, rather than eliciting reductive and evanescent reactions stemming from sudden turns in plot or pacing. 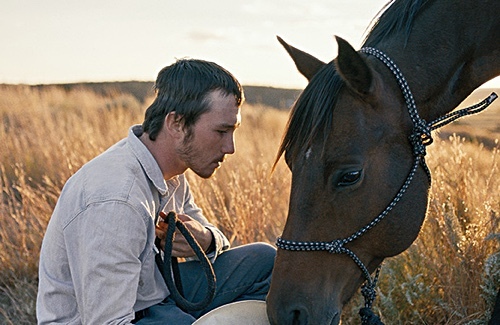 From its simple but elegant visual style to its deeply humanist approach of allowing the camera to rest on faces and bodies—including that of animals—writer-director Chloé Zhao has created a work that will undoubtedly stand the test of time. It is a joy that it took me completely by surprise. One may read plot summaries and jump to the conclusion that the story is boring, perhaps even depressing. But there is nothing boring or depressing about it. Adopting almost a documentary style, even employing real people who play a version of themselves, Zhao ensures that we relate to the drama. The style is so confronting, we look at the physically broken Brady Blackburn (Brady Jandreau) and wonder how we would react when our own bodies are forced to give up our passions. Brady, you see, had just undergone a major operation on his skull because he had fallen off a horse at a rodeo show. Medical professionals advise him never to ride again or risk losing his life. I found the picture to be uplifting and moving despite the subject matter. This is because the writer-director has a way of catching deeply personal moments that ring so true, I was actually reminded of beautiful moments in my own life, especially the impressions that have made an imprint in my mind and my heart. One sequence that I found to be unforgettable is Brady training wild horses. Errors in hand placement, pulling the rope a little bit harder than one ought to, or making sudden movements makes the horse react. You can tell that Jandreau has been around horses all his life, that he respects and loves these creatures deeply, because of the way he puts even the most temperamental animals at ease. At times he does so simply by making eye contact with them. I found the psychic connection, or whatever is, so poignant. Meanwhile, Zhao commands control of the camera by simply capturing a person doing his job. As a result, we learn plenty about horse training—what to do, what not to do, and the importance of instinct—by observation. The approach is romantic rather than analytical. There is even poetry in keeping us at arm’s length. An incredibly touching scene involves Brady having to say goodbye to a white horse named Gus. Observe how the two of them riding across the prairie is shot. Initially, there is no wide shot in which the rider and the horse can be seen together completely. We see images of the horse’s powerful legs galloping across the land. We notice Brady’s exhilaration of being on a horse again after his skull surgery. He doesn’t smile but he holds the experience with pride. We see the rider, the horse, and the pale light background—but the framing is executed in such a way that there is no full body shot. The incompleteness, so to speak, is done on purpose, you see, because Zhao, I think, wishes to preserve the final intimate moment between the horse and his owner. We are welcome to observe… but we cannot share their moment on the level that they are sharing it. And when finally do see a full body shot of them together, we are still kept at a good distance. So, as you see, there is a lot of thought put into how its images are put together. It makes a world of difference. “The Rider” is best discovered and so I made sure to touch only the surface in this review. Those with a penchant for deeply humanist stories are certain to be spellbound by its seemingly simple premise and execution. There is a wealth of insight to be found here. This review of the film stirred my interest. Searching for it now. Did you get a chance to watch it? Yes!! I rented it and it felt like a character study and very humanistic approach. Lovely, but a little under the radar and muted. I felt. It was like a monotone speaker, everything was executed at a similar level? Something I don’t care for all that much, but the cinematography and actual story was interesting? That’s exactly what I loved about it: it’s muteness. This ties back to our protagonist. It almost feels like a documentary. Happy you gave it a go!